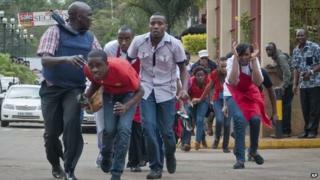 A year on from the assault by Islamist militants on the Westgate shopping centre in Nairobi, Kenyans still have questions about the four-day siege and its aftermath. It was the worst attack on Kenyan soil since the 1998 US embassy bombing by al-Qaeda - leaving 67 people dead and more than 200 wounded. The military, police and spy agency have been battling to save face over the handling of the rescue operation. 1) Was the rescue bungled? Initially, the police and members of the public tried to repel the attack. As hours went by, the government sent in the military. Rivalry between the two forces started when a commander of the police elite squad was killed in friendly fire by the military. The changeover angered the police and they left in protest as the army took control of the building. A military commander involved in the operation, who spoke to the BBC on condition of anonymity, said that is when things started to go wrong. "We entered the mall blindly with no guide, with no concept of anything. Command and control was not there," he said. "The police felt they were undermined. The military thought the police didn't want to give them enough information so everything went wrong." Interior Minister Joseph Ole Lenku maintains the operation was handled well. "I am happy with the way police responded. However, it was necessary for the military to bring protective gear and armoured carriers and their skill. As a country we are happy how they worked together." 2) Attackers - who were they and did they die? Somalia's al-Qaeda affiliate, al-Shabab, said it had attacked the mall because Kenya sent troops to Somalia to bolster the UN-backed government. Kenya's military spokesman named four of the gunmen as Abu Baara al-Sudani, Omar Nabhan, Khattab al-Kene and Umayr. "I confirm those are the names of the terrorists," Major Emmanuel Chirchir tweeted at the time. All four were said to have crossed over the border from Somalia before the attack. It is thought the names given by the military may be noms de guerre as one of the gunmen was subsequently identified as Hassan Abdi Dhuhulow, a 23-year-old Norwegian citizen of Somali origin. Recovered remains of the alleged attackers are still undergoing forensic tests by the FBI. Kenya's chief pathologist Johannes Oduor, who was part of the team initially examining them, says he was unable to confirm if the bodies were those of the attackers. "I am still waiting for the report," he says. Mr Ole Lenku says the report on forensic analysis samples may be able to answer these questions. "Until we get it we can't give any concrete information on their identities to establish their names and nationalities." 3) What happened to the inquiry? President Uhuru Kenyatta promised to form a commission of inquiry to investigate the attack and any failings by security agencies. But to date nothing has happened. "We did promise, but parliament took up the process and did their best and came up with a report that actually necessitated a number of actions towards improving the country's security," Mr Ole Lenku says. But no-one was sacked or held responsible as a result of the MPs' report, released in March. Security analysts say a public inquiry into Westgate could have been embarrassing. The parliamentary investigation was a way of protecting the military, which had been criticised following allegations that soldiers looted shops in Westgate, they say. 4) What happened about the looting? The military was accused of looting when CCTV footage emerged showing soldiers carrying bags out of the shopping centre. When merchants returned to Westgate they found most of their shops had been vandalised. Pictures circulating on social media revealed shelves, cash drawers and safes broken into. National Intelligence Service: Blamed for failing to detect the planned attack, but said seven top officials were given an intelligence report in 2012 warning of an attack. The government said the soldiers with carrier bags were helping themselves to water from a supermarket to quench their thirst during the operation. In October, two soldiers were named, charged and jailed for the looting. Victor Otieno and Victor Ashihundu were court-martialled but their sentences have not been made public. They were allegedly found in possession of mobile phones, cameras and battery chargers. 5) What has happened about compensation? The government promised to pay compensation to survivors and help settle their medical bills. But those contacted by the BBC say this has not happened. "It's been tough because I don't have any income," says Anne Moraa, a manager of a shop selling handbags in Westgate, who was trampled as she tried to escape. She had to pay her own hospital bills. She is continuing to pay for counselling as she is too traumatised to go into any shopping centre. "We have been waiting for the government to compensate [us] - I haven't seen anything yet," Ms Moraa says. "After Westgate many people went to hospital, the government didn't follow them up. There is no support group for survivors." A military officer injured by a grenade thrown by one of the militants says he is also waiting. The grenade killed two of his colleagues. "I have not been compensated. Neither have the families of those soldiers that died in the attack. I have not been told anything. Maybe it's in the process and has not been communicated to us," said the soldier, who is still receiving treatment for his injuries. Mr Ole Lenku told the BBC he could not comment on these cases. "I know the concern has been raised but it involves a lot of variables," he said.